What is the role of Sushi Chef? Sushi Chefs are trained in Japanese cuisine and prepare different kinds of sushi rolls most commonly in specialised sushi restaurants. 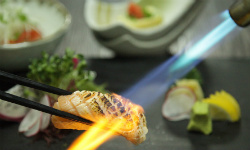 Sushi Chefs are also responsible for preparing sushi and sauces, selecting ingredients, storing food, maintaining supplies, creating menus, training staff, and designing sushi plates. How long does it take to become a sushi chef in Japan? It is estimated that a sushi chef in Japan take at least 10 years to train as a sushi chef.